Magic Plant excitedly announces that we now offer a “Welcome Kit” for our prospective customers. Magic Plant has exclusive rights for all our Magic Plant products. We invite your company to become part of this new exciting market. We offer a product line that fits all types of stores for virtually any purpose. In your welcome kit , you will find approximately 10-15 Magic Plant items. The kit you receive will contain one item from every product category we offer. This gives you a good idea of the types of products we have as well as the high quality of standard we portray. Order sample kits may contain a variety of product samples. For example, you may receive a ghost chili product, a scorpion chili product, a sample of one of our chili powders, a package of dried chili pods, a jar of pepper mash, a chili pepper growing kit, Nature’s Greeting Plant, a Flower Growing Kit, a Herb Growing Kit, Nature’s Greeting Card, a Lotto Plant to Grow Your Own Lucky Numbers, and a Baby Magic Egg. Each kit may contain different products, but you will receive order samples containing one product from each of our product categories. Would You like to Choose Your Order Samples? At the time you place your order, you may request some specific items that you would like to sample. Please just add a note or some comments to your order during the checkout process. We will do our very best to ship the items you requested. 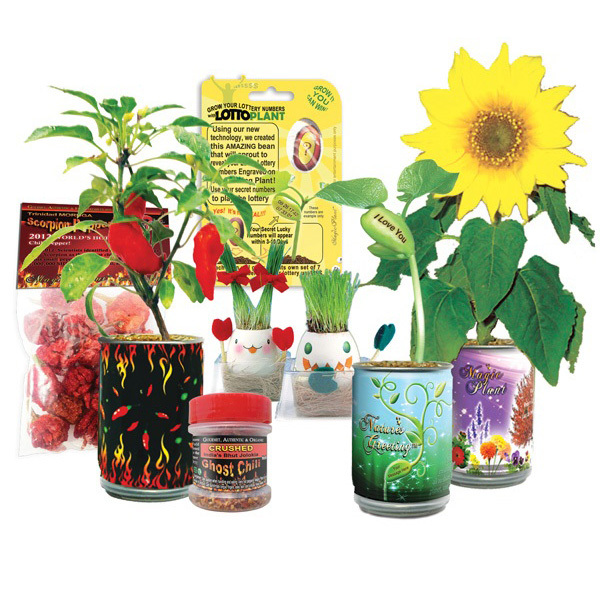 For example, if you are specifically interested in hot chili pepper products, growing kits for children, or our Nature’s Greeting Plant/Message beans, then just add a note to your order so we can add it to your order samples.